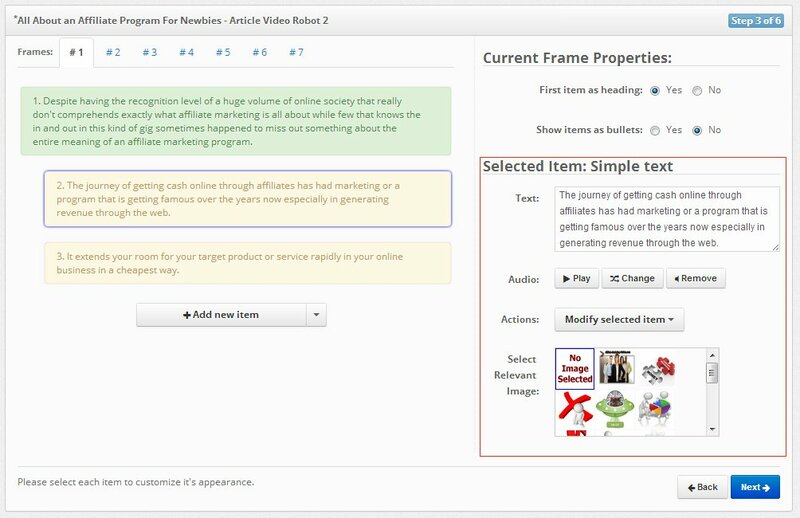 As you can see in Step 3, wizard has turned your article into a video with frames and items. The frames are arranged on the top and you can navigate between them by clicking on the tabs. You can also navigate between frames using the "Next" and "Back" navigation buttons at the bottom. You can navigate between items by clicking on them. The selected item is always shown with this purple border around it. This indicates that this item is currently active and any changes you make will be applied to this item only. You will notice that the as you change the selected item, the panel in the bottom right half keep changing with it. This is Active Item properties box. You can edit the properties of the currently selected item from here. You can use this option to edit the text, select an image and edit the audio for any particular item.